Low platelet count, medically called thrombocytopenia, is a health disorder where there is an abnormally low amount of platelets in your blood. Platelets are the smallest of blood cells that help in the blood clotting process. As such, low platelet count is often associated with abnormal bleeding. Platelets circulate the blood circulatory system with an average lifespan of 5 to 9 days. A healthy and normal platelet count, in a healthy human, ranges from 150,000 to 450,000 platelets per microliter of blood. When the platelet count dips below 150,000 platelets per microliter of blood, such a situation is considered a low platelet count. 1. Low production of platelets in the bone marrow: Low production of platelets in the bone marrow may be as a result of; cirrhosis (liver scarring), folate deficiency, vitamin B12 deficiency, cancer in the bone marrow (such as leukemia), aplastic anemia, myelodysplastic syndrome, medications such as chemotherapy, and infections that affect the bone marrow. 2. Increased breakdown of platelets in the bloodstream: This can be caused due to medication, an autoimmune disorder in which the immune system destroys the platelets (Immune thrombocytopenic purpura), disorders that cause blood clots to form in small blood vessels, thus, leading to low platelet counts (Thrombotic thrombocytopenic purpura), and disorders in which proteins that form blood clotting become overactive (such as in Disseminated intravascular coagulation). 3. Increased breakdown of platelets in the spleen or liver: This can be caused due to an enlarged spleen. Symptoms of low platelet count include; bruising, bleeding in the mouth and gum; and rash-like red or purple spot on the skin called petechiae. Women may also experience unusually heavy menstrual flow. Avoid taking tonic water as the quinine in it tends to decrease platelet count. Limit your alcohol consumption as it could hamper the optimal production of platelets. You should consult your doctor before taking over-the-counter medications as some of them could affect your blood platelet count. Include foods that act as blood purifiers, such as grapefruit and aloe vera, to your diet. Avoid consuming highly processed foods that have little to no nutritional value. Apart from maintaining healthy body tissues, ascorbic acid can prevent low platelet count. Basically, your body requires about 500-2000mg of vitamin C on a daily basis depending on your age. With this in mind, you should eat foods that are rich in vitamin C such as broccoli, lemons, tomatoes, kiwi, bell peppers, and spinach. If you notice symptoms such as fatigue, bruising, and bleeding gums, that’s a red flag your platelet count could be low. Beetroot has hemostatic and antioxidant properties while carrots are rich in vitamin A which facilitates healthy platelet production. The two play an important role in cell division and sustain normal body functions. To curb thrombocytopenia, you should eat a bowl of carrots and beets 2-3 times a week. You can also add these fruits to your soups and salads. This nutritious fruit is helpful in increasing low platelet count. It has high iron content which is evident from the red color. In addition to that, it has immune-boosting, antioxidant and anti-inflammatory properties which prevent free radical damage. You can either eat the fruit in raw form or make some juice. Alternatively, you can incorporate the fruit in your breakfast bowl, smoothies and salads. Fresh milk is an excellent source of vitamin D, calcium, and vitamin K. Without these essential nutrients, your blood will take more time to clot. Besides improving platelets count, it will boost your body’s immunity. To ensure you have enough calcium in your body, you should drink a glass of fresh milk before going to bed. You can also add milk to your breakfast bowl or desserts. If you don’t have access to fresh milk, consume more yogurts, cheese, and other dairy products to keep your energy level up. Pumpkins can help to raise the platelet level by regulating the protein produced by the body cells. It’s rich in vitamin A which plays an important role in platelet development. So if your platelet count has gone below the 150000 level, you should drink a glass of pumpkin juice twice a day. You can also add pumpkin puree in your stews, soups, green smoothies, and other side dishes. This fruit is rich in vitamin C, an antioxidant which helps to keep platelets at normal levels. Furthermore, Indian gooseberries boost your body’s immunity. To benefit from Indian gooseberries, mix two tsp of Amla with honey. Alternatively, eat 2-3 Indian gooseberry fruits when on an empty stomach. You may also want to eat pickles or jam made with fresh Indian gooseberries. Papaya is a versatile fruit that offers numerous health benefits. For instance, the papaya leaves increase dipping platelet counts in patients suffering from dengue fever. You can either eat a ripe papaya or make your concoction by boiling papaya leaves in a kettle of water. Make sure the water content reduces by half during boiling. Then, drink the resulting solution twice a day. You can also buy the leaf extract from a food shop. For best results, take a ripe papaya together with the leaf extract. Wheatgrass has a molecular structure similar to hemoglobin which makes it effective in increasing the platelet count. Plus, it contains antioxidants that prevent free radical damage of platelets. There is also some evidence that sipping wheatgrass juice can help to increase white blood cells and red blood cells in the body. To increase a low platelet count naturally, drink a cup of wheatgrass juice in the morning and evening. If you don’t like the taste, you can add a few drops of lemon juice. Spinach provides a healthy dose of vitamin K which plays a key role in the production of platelets. If your platelet count is not within the range of 150000 and 450000mg per micro-liter, you should eat more spinach to prevent excessive bleeding. You can enjoy this green vegetable by adding it to your soups, salads, and side dishes. Alternatively, prepare a fresh spinach soup by boiling a handful of spinach in two cups of water for 15 minutes. Drink the soup up to three times a day. This cold-pressed oil improves blood circulation and reduces the damage caused by free radicals. 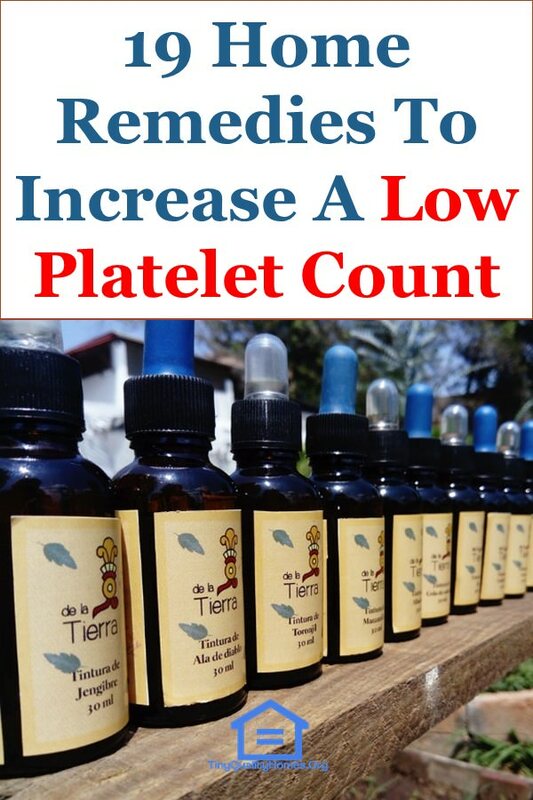 Sesame oil also aids in increasing the platelet level count in the blood. To combat thrombocytopenia, drink 1-2 tsp of sesame oil two times a day. You can also rub some sesame oil on your lymph nodes or include it in your dishes. Since platelets are made of proteins and water, you should drink enough water throughout the day. That way, your body can produce more blood cells which improve platelet count. Also, With a well-hydrated body, your body is able to flush out more toxins. Although the daily recommended water intake is 2-3 liters, you can take more especially when exercising. Experts recommend that you avoid drinking cold water since it can interfere with the absorption of nutrients. Instead, take purified water at room temperature. Also, avoid tonic water as the quinine in it could lead to decreased blood platelet. A number of studies show that engaging in physical activities increase platelet release from the lungs, liver, spleen. Other than that, exercises improve the immune system and blood circulation which leads to an increase in platelets count. If your platelets are in 20000-60000 platelets per microliter of blood range, you should perform exercises such as cycling, biking, and aerobics. However, if your platelet count is below 15000 you should avoid exercising since it can result in more bleeding. Raisins are dry fruits that contain 30% iron. To increase blood platelets count, you should soak some raisins in cold water overnight and consume them in the morning when on an empty stomach. You can also add them to your breakfast bowl. Popping 2-3 raisins in your mouth between large meals will also work effectively. Lean protein foods are a rich source of vitamin B12. When your body is deficient of this essential vitamin, the immune system would perform suboptimally. To increase your platelet count, you should consume fried eggs, cheese, or take a glass of milk in the morning and evening. Other foods rich in vitamin B12 include salmon, chicken liver, yogurt, and turkey. Brussels sprouts contain beta-carotene and vitamin K which aid in platelets production. Additionally, they increase the white blood cells count while boosting the immune system. Furthermore, deficiency of vitamin K can cause continuous bleeding. To increase your platelet count, toss a few brussels sprouts in your veggies and salads. Seasoned or grilled Brussels will give the best results. These fruits are packed with omega-3 fatty acids which reduces the risk of low platelet count. Besides that, they contain vitamin D and K which support calcium absorption in the body. Also, almonds and walnuts increase red blood cells and boost your immune system. You can either include them in your breakfast bowl or add them to your salads. Regular consumption of almonds and walnuts will have a positive effect on platelet aggregation. Contrary to popular belief, kiwi is not a poisonous fruit; it has more than 20 essential nutrients. It contains vitamin C and polyphenols that increase platelet count. Apart from that, it’s rich in vitamin B6 which helps to boost your immune system. To increase platelet count, you should eat a kiwi fruit 2-3 times a day for five consecutive days. You can also extract the juice and drink two glasses a day for five days. Vitamin K increases the synthesis of bone proteins and aids in blood clotting. It would also keep the cell growth at optimal levels. Some of the red flags that you have vitamin K deficiency include tooth decay and weakened bones. Vitamin K can be obtained in foods such as cabbage, broccoli, spring onions, dried basil and green leafy vegetables. Another way of increasing platelets is to take vitamin K supplements. The recommended daily dosage is 65mg for females and 80mg for males. Consult your healthcare provider before taking any supplement. Studies have linked a deficiency of vitamin B9 to a reduction of blood platelets. Folates play a vital role in rapid cell division and aids in the proper functioning of the brain. To increase your platelet count, you should consume foods that are rich in vitamin B9 like spinach, asparagus, orange juice and fortified cereals. If you want to go for supplements you should consume 500mg of folate every day. Consult your healthcare provider before taking any supplement.